Syria inflation: Hyperinflation's not about money. 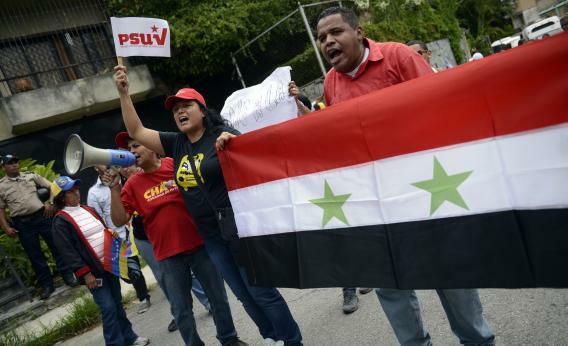 Activists take part in a pro-Syria demonstration outside the Syrian embassy in Caracas on August 29, 2013. The larger lesson here is that this is the typical situation. Milton Friedman famously said that “inflation is always and everywhere a monetary phenomenon” which I believe was meant as a rejoinder to people who favored wage and price controls. And there’s some truth to that. But really big inflations—the dread hyperinflations people warn about when they tell you Ben Bernanke is turning America into the next Zimbabwe—are really never monetary phenomena. They are the outcome of political crisis: Civil war, foreign conquest, reparations agreements, whatever. Putting a solid conservative central banker in charge of things in Damascus wouldn’t change anything. The issue is that the country’s real economy has been wrecked by violent conflict.